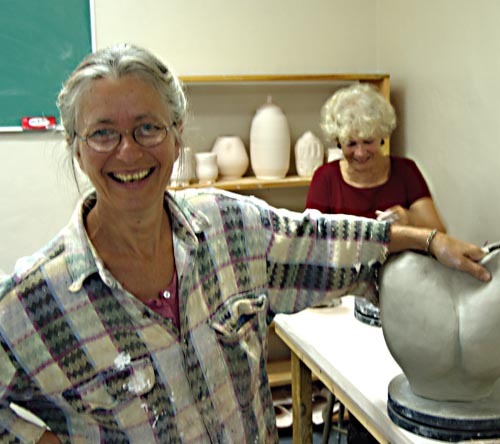 Jayn Avery, a well-known Floyd potter who operates the Blue Heron Pottery, recently taught a 3 day introductory course at the Jacksonville Center using paper clay as the medium. The clay is available in many different formulations with firing ranges from cone 05 to cone 10. You can get an idea of the many options available by visiting one of the many supplier’s websites. When glazed and fired, the final results are indistinguishable from conventional pottery except that it weighs less. For more images and a discussion of Jayn’s course, visit Jacksonville Center Online. To give you some idea of the potential of this medium, see what artists like Barbara Sorenson are creating. 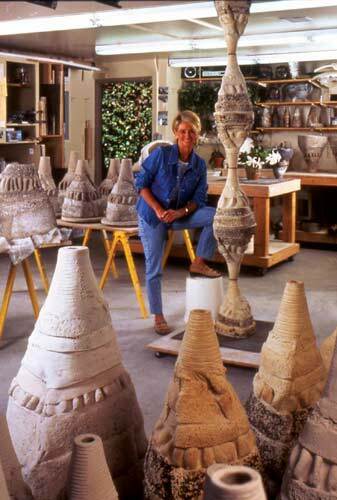 Barbara was among the first to confront the use of paper clay and it has turned out to be a productive medium for her work. David, I loved seeing the work of Barbara Sorenson. I love the big stuff. And yes, it looks like she assembles pieces. You can make them so they fit into each other after firing. One of my students in that class (the one who brought in the live chicken model) kept remarking on the smooth texture of the clay. She is an elementary school teacher and thought her students would really appreciate the difference in texture. My friend Joe who works with kids having behavioral problems in school is going to try it. Clay is a natural for therapy.